If you’re envisioning a sweet syrupy sauce to drizzle on top of ice cream and cakes, sorry friends, this is not that recipe. 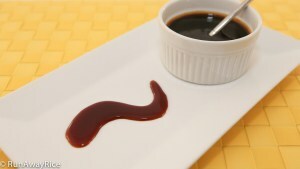 This caramel sauce is made by cooking sugar to a dark molasses-like consistency that is slightly sweet and slightly bitter. The sauce is then used to marinate meats or to add subtle flavor and color to dishes during cooking. In Viet cooking, you see this sauce used most often in braised “kho” dishes as this gentle cooking technique is low and slow and allows the essence of the caramel sauce to permeate the food. If you’ve followed my earlier posts, you may have noticed that I’ve shared several braised dishes traditionally requiring this caramel sauce. I, however, have shared shortcuts and substitutes for the caramel sauce. Why you ask? Well, the reason is because this seemingly simple ingredient is quite tricky to make. The sauce itself doesn’t take long to make but, the success of this recipe is all in the timing. Cooking the sugar to achieve just the right color is tough especially if you’re not familiar with how quickly sugar burns once it reaches a certain stage. Cook it for too long and the sauce is bitter and burnt tasting. Undercook the sugar and the sauce is too light and isn’t balanced in flavor, more sweet than bitter. I do want to say there is an element of personal preference with this recipe. Some people prefer a darker, more bitter than sweet sauce while others prefer more sweet and less bitter. My recommendation is to practice and make a sauce that you like and then write down the time (to the seconds) and use that every time. Enjoy! A word of caution, cooking with sugar can be a dangerous thing. Sugar is extremely hot when cooked to this stage so be really careful not to get any of the sauce on your skin. Don’t touch the sauce with your fingers and be sure to use heat-proof utensils when stirring the sauce. Also make sure to allow the sauce to cool adequately before transferring and storing. Use a large saucepan to cook the sugar. The sugar can boil quickly and overflow if you’re not watching closely. If the sauce boils over, it’s one big mess to have to clean up. So save yourself the hassle and use a generously sized pan. Add hot water to the caramel sauce instead of cold water. Depending on how hot the caramel sauce is, adding cold water could cause it to bubble vigorously and spill out of the pan. Pour the sauce into a clean jar and then store in your pantry. The sauce is good for up to a year. Coca-Cola Braised Pork and Eggs (Thit Kho Trung) – In this recipe redo we substitute Coca-Cola for the caramel sauce. If you’d like to use your homemade caramel sauce for this recipe, substitute the Coke with water and then add 2 tsp of caramel sauce. Braised Fish in Clay Pot (Ca Kho To) – In this recipe shortcut , we make just enough caramel sauce for the recipe. If you have the caramel sauce handy, just omit the sugar and add 1-2 tsp of caramel sauce. Braised Seitan and Vegetables (Mi Can Kho Chay) – substitute 1 tsp of sugar with 1 tsp of caramel sauce for added flavor and color. In a medium saucepan, combine the sugar with 3 Tbsp of water. Set the heat to Medium and start cooking the sugar. After 3 minutes the sugar starts to melt and bubble. Give it a stir and continue cooking. After 4 minutes the sugars starts to turn a golden brown color. After 6 minutes the sauce becomes a rich brown color. After 7-8 minutes the sauce turns from a dark brown to a deep red color and the sugar starts to smoke. Cook for another 30-45 seconds allowing the color to deepen further. Turn off the heat and let the sauce cool on the stove for approximately 10 minutes. If the sauce starts to bubble vigorously and the sugar smells like it’s burning, carefully immerse the bottom of the pan into a bowl of water to stop the sugar from cooking further. Allow the pan to cool in the water for about 5 minutes and then return to the stove. Add the hot water to the sauce and stir together over Medium heat. When the sauce starts to boil again, turn off the heat and continue stirring for another minute. Allow the sauce to cool for at least 10 minutes before transferring to a clean jar. The sauce will thicken up further as it cools. 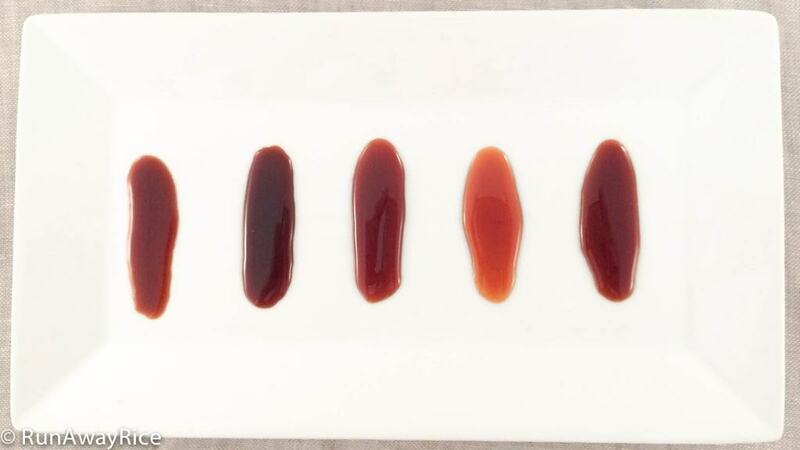 Check out the Caramel Sauce Color Slide and compare with your sauce. #1 The sauce is a rich, dark amber color but the sauce is thin indicating too much water was added. #2 The sauce is a dark reddish brown color. It was cooked a tad too long. The taste will be more bitter than sweet. #3 This sauce is a beautiful dark amber and is the desired result. Notice how thick the sauce is as well. #5 This sauce is again nice and thick and a lovely dark amber color. This is the how we want our caramel sauce to look. When cooled, should it become hard? The colour of mine looks ok however now that I’ve transfered it to a jar and allowed it to cool it has become rock hard and I feel like I will need to re-heat it to use it. Is this normal? The caramel sauce should not re-crystallize and become hard. It should maintain it’s liquid form with a honey-like consistency. I think you may have cooked off too much of the water. Here’s something to try: Reheat the sauce in the microwave until it’s liquid again. Add 1 tsp water + 1 tsp of lemon juice and mix well. Let it cool and this should prevent it from re-crystallizing again. Good Luck! I am always afraid of burning the sugar in making Caramel Sauce (Nuoc Mau). Do you think I can use molasse as a substitute? What do you think about those Sweet Soy Sauce, the thick sauce that is on the sweet side? You can use dark molasses as a substitute. Find the molasses without any add spices as some will have ginger, cloves, etc. I encourage you to give this recipe a try. Review the tips and tricks I shared in this post and if you’re worried about the smell, cook it outside until you perfect it. The Sweet Soy Sauce is fine too, it’s a different flavor–less bittersweet and more salty sweet but would be a good substitute in any dish. Good Luck! Thank you for your recipe, I finally made it successfully. Before watching your video, I temped to make Nuoc mau so many times for Thit kho, but I only melted sugar first then when it started bubbling, I added water so the sauce turned out either burnt or thicken so fast that I couldn’t use anymore. Now, I already have a small container for the nuoc mau made from your recipe. Hi! I am glad to hear you found the recipe helpful. Making Nuoc Mau is tricky and I’ve had my share of some terrible results. I appreciate you sharing comments on my channel. It is my goal to keep my videos short while still being informative. I know most people don’t have the time (or patience) to watch a 10-minute cooking video. Yes, I’ve thought about doing a Vietnamese-speaking video but am waiting for the perfect recipe. Perhaps you will share some ideas with me 🙂 Thanks for tuning in and Happy Cooking! Hi. Thanks for these videos. I tried making the caramel sauce and it tastes a little burnt. Is it supposed to or should I try again. Sorry I have never tasted this kind of sauce so hard to know if bitter/burnt is wrong. I want to make your ginger chicken recipe this week. The Caramel Sauce should be bittersweet (slightly more bitter than sweet). I added a picture at the end of the post so you can compare your sauce color with my samples. If your Caramel Sauce is darker than the #2 sample, it was over-cooked and that’s probably why it tastes burnt. If this is your first time making it, it does take several tries before you get the timing right. If you’d like to try your Caramel Sauce in the Ginger Chicken recipe, use 1/2 tsp (instead of 1/2 Tbsp) especially if you think it’s bitter. Good Luck and let me know if you have have any questions. Is this the same as the one in the store that comes in a square-ish plastic jar about 3 inches in height? I always thought it was the dark thick soya sauce which is popular in Malaysia and Singapore. I haven’t seen the caramel sauce packaged as you described but yes, this sauce does look a lot like dark or thick soy sauce. At my Asian grocery stores, they’re sold in glass jars or in squeezey plastic bottles.